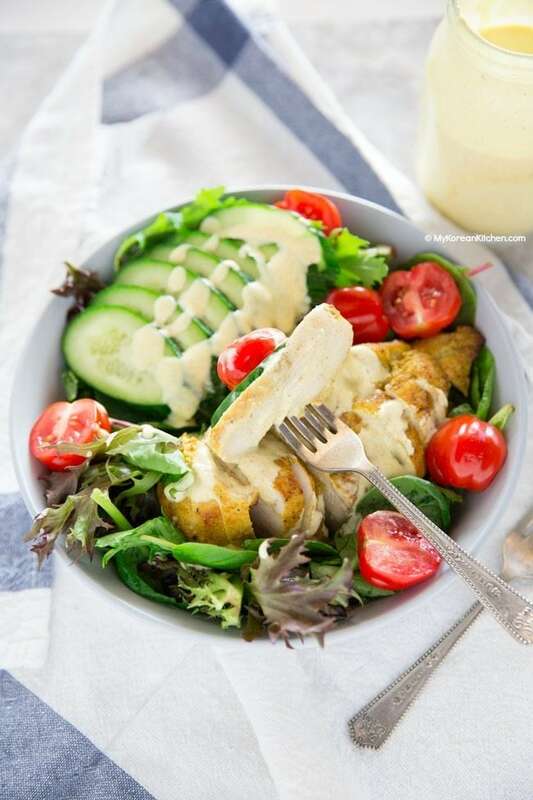 This oven baked curried chicken breast can be served in a sandwich, wrap or in salads. 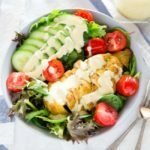 It’s a versatile dish that will also give you a healthy, light and meal prep friendly lunch/dinner option! Koreans love using curry powder in their cooking. Obviously, you can make curry with it, but also it lends nicely in a marinade, so many Koreans use it with meat, particularly with chicken. So, in today’s recipe, I used curry powder as a spice rub to marinate the chicken. So what’s special about this curried chicken recipe? Well, for a start, it is one of my very old recipes (from 2006)! It was time for an update. Also, when they are served with green salad or in a wrap, they make a light and healthy meal! I often serve it this way for our family lunch and dinner. Anyway, it’s a must try recipe for those who love healthy food and curry flavor. Hope you try it soon! ** If you want to learn more about Korean ingredients, check my 30 essential Korean ingredients list. 1. Place the chicken in a large glass container. Add all the seasonings (from main ingredients) and gently rub them around the chicken to season. (I wear a food prep glove for this process.) Cover with the lid and refrigerate it for at least 4 hours (or overnight) to marinate. 2. Pre-heat an oven at 200 C / 392 F. Pre-heat an oven safe skillet over medium high heat. Add some cooking oil. 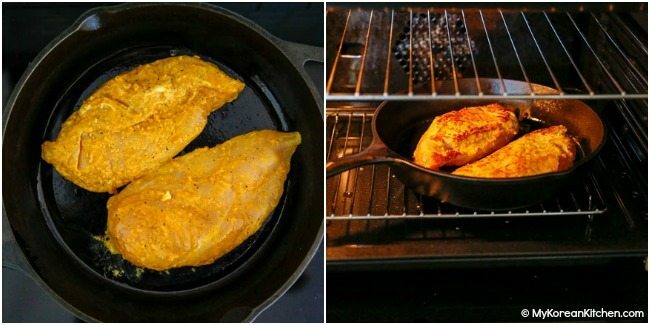 Cook the chicken breast for 1 min on each side. (Cook shorter for tenderloins.) Transfer the skillet into the oven, cook the chicken until it’s fully cooked. (Takes about 15 to 18 mins for a large chicken breast fillet.) Remove the skillet from the oven. 3. (Cool down the chicken 5 to 10 mins, if serving it cold.) 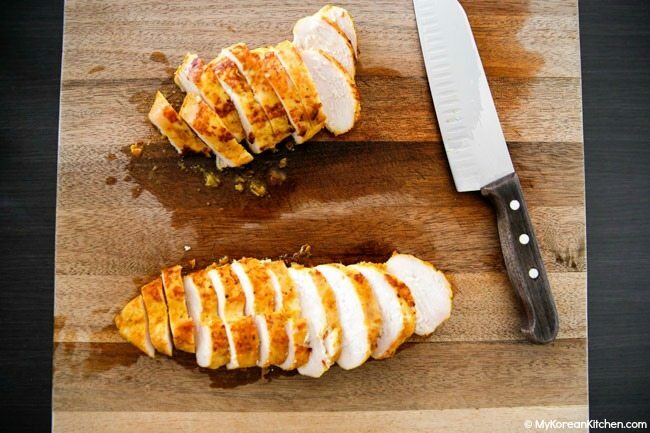 Slice the chicken per your preference – thinly slice, cube or pull apart. 4. 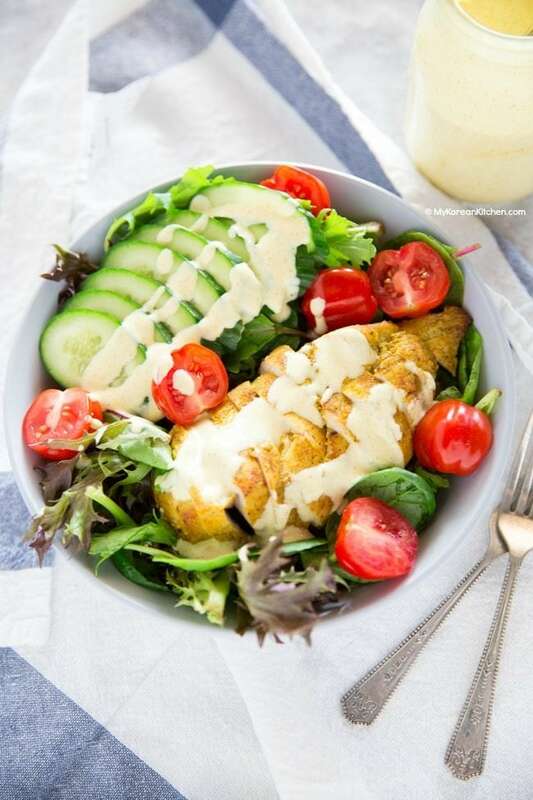 Serve the chicken with your choice of salad mix and curried greek yogurt dressing. Alternatively, you can serve it in a healthy wrap. I cook only half of the marinated chicken at a time (for a family of 4). And cook the remainder within 4 days of being marinated. Cooked curried chicken can be refrigerated up to 2 days without ruining the taste too much. Uncooked curried chicken should be refrigerated up to 2 days (according to USDA Food Safety and Inspection service) but I have stored up to 4 days in the past. Or you can freeze it for up to 1 month without compromising the taste and texture. If freezing, defrost it in the fridge overnight. Curried yogurt dressing can be refrigerated for up to 5 days. 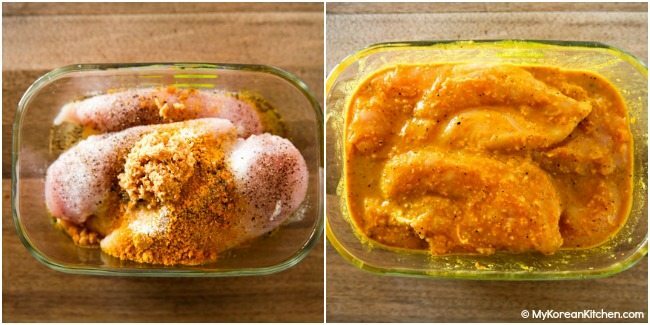 Easy baked curried chicken breast recipe. Place the chicken in a large glass container. Add all the seasonings (from main ingredients) and gently rub them around the chicken to season. (I wear a food prep glove for this process.) Cover with the lid and refrigerate it for at least 4 hours (or overnight) to marinate. Pre-heat an oven at 200 C / 392 F. Pre-heat an oven safe skillet over medium high heat. Add some cooking oil. Cook the chicken breast for 1 min on each side. (Cook shorter for tenderloins.) Transfer the skillet into the oven, cook the chicken until it’s fully cooked. (Takes about 15 to 18 mins for a large chicken breast fillet.) Remove the skillet from the oven. (Cool down the chicken 5 to 10 mins, if serving it cold.) Slice the chicken per your preference – thinly slice, cube or pull apart. 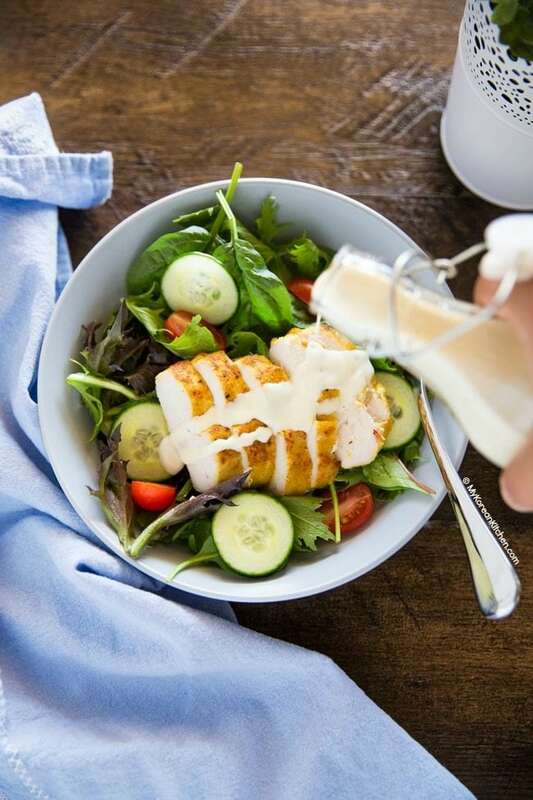 Serve the chicken with your choice of salad mix and curried greek yogurt dressing. Alternatively, you can serve it in a healthy wrap. wow! This looks delicious!!! Can’t wait to try!! This looks delicious! Thank you.